When you write about audio, it’s good practice to keep a mental roster of audio companies – even ones whose equipment you haven’t tried yet. Mostly, this is just good journalism, but it’s also so that when someone an audio show says “What do you think of the new Superlux Extreme Whizbanger 6000?” your next question isn’t “Who are Superlux?” Normally, keeping this constantly-shifting roster updated doesn’t take too much effort, and we flatter ourselves that we know most, if not all, of the audio industry players, and what they do. But we hadn’t heard of H2 Designs. 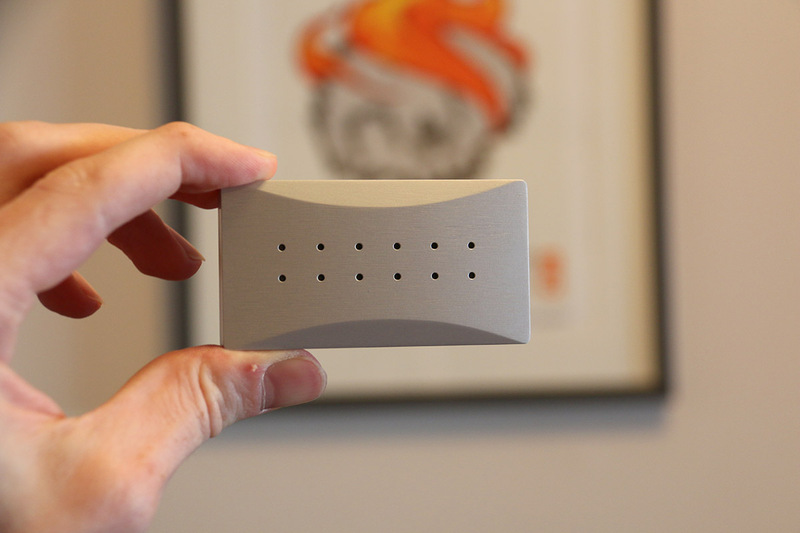 They’re a three-person team, relatively new to the industry, and recently got in touch to ask if we’d like to try out their new MIYO audio interface. After a month with it, we think their name is going to be in our mental roster for quite some time. At its heart, the H2 MIYO - as in, My I/O (In/Out) - is a very simple audio interface designed to serve as a connection between your laptop or PC, and your headphones. It’s not only the smallest audio interface we’ve ever tested, but also very possibly the smallest thing we’ve ever tested. Even the miniature Schiit Fulla 2 (full review) is a galumphing elephant next to this thing. It’s a tiny rectangular box, smaller than a business card, and about the thickness of a finger. It’s made of brushed metal, and despite its compact size, it feels reasonably substantial. There are no buttons – just a set of LED indicators, and a couple of inputs and outputs. We’ll get to how all of those work in a moment, but what you need to know first is that for such a small little guy, the MIYO does a hell of a lot. It’s actually quite astounding just how much functionality is packed into the slim metal frame. It functions as a DAC (Digital-to-Analogue Converter), a standalone ADC (the same, just reversed), a headphone amp, and a signal splitter. We don’t really handle professional audio equipment here at TMS, but if you’re inclined towards mixing and mastering, this will function as a perfectly capable audio meter as well. It does all of these things, and it does incredibly well, which is down to some seriously smart design. Let’s talk about the inputs and outputs first. You can connect it to your laptop with a simple, short USB cable, attaching it to the short end of the rectangle. On one side, there’s a stereo line level input, and on the other, two unbalanced headphone outputs. All three of these ports are 3.5mm, and while it would have been nice to see a 6.3mm out, we can hardly fault H2 for wanting to streamline the design – especially when an adapter off Amazon is so cheap. All in all, there’s nothing here that is too surprising, or that we didn’t expect to see, but you only have to play around with the MIYO for a few minutes to realise that there’s a little more going on here. Tilt the MIYO towards you when it’s plugged in, and you’ll see a red glow coming out of the headphone ports. That’s not cosmetic. Each port also functions as an optical out, meaning that you can take any analogue input and convert it to digital. It’s a simple, intuitive design choice, and it works effortlessly. It’s also an indicator – if you’ll forgive the pun – of how the MIYO does its thing. Across the top, you’ll find twelve tiny LED lights that flash in the glorious rainbow pattern when you plug the interface into a USB port. This isn’t cosmetic. It’s a very intelligent metering system that tells you not only when audio sources are plugged in and what type they are, but what decibel range they are playing out at. We’re not really going to go into exactly what different combination of lights mean – it does get a bit technical, especially if all you want to do is listen to some music – but there’s no denying that it works incredibly well. H2 have actually put together a video showing off how this works, and if you are interested, you can check it out below. The level of detail communicated by the LEDs maybe a little bit overkill for anybody just wanting a simple way to listen to music. But even if you don’t rely on their functionality, they don’t change how the MIYO functions. And there’s no denying they look terrific. It’s not just the exterior that’s clever. H2 have left volume controls off the unit, arguing that two volume sources (one from the computer, and one from the interface itself) would complicate things, and degrade the sound. Instead, they’ve shifted everything to the source. Controlling the volume is as simple as using the volume keys on your computer or laptop, and although this was a little bit jarring at first – especially as we were accustomed to reaching for a hardware volume knob – we soon got used to it. The design does, however, have one downside. This thing kicks off a lot of heat. Like, a lot of heat. Like, we were actually a little scared to touch it after a couple of hours in case we burned our fingers. While we’re pretty (OK, sort of) sure that that wouldn’t happen, there’s no denying that the MIYO puts out some serious power. It was never a problem – even after hours of use, it never burned the hole in our desk that we expected it to. H2 have dealt with this by turning the entire aluminum body into one big heatsink to maximise surface area, but if you go for it, you need to be aware that it does this. It’s also worth noting that you almost certainly won’t be running this off of your iPad. It needs more power than that particular device – or any other portable one – can supply. In a weird way, the sound of the MIYO is almost secondary to the design. It does so many intelligent things, and does them so well with such a tiny footprint, that the sound is almost an afterthought. That sounds like a negative assessment, but it shouldn’t be taken as one. The MIYO sounds just fine. It has at least a toe in the waters of professional audio gear, and so it goes out of the way to present as neutral a picture of the sound as possible. Anybody into the warm, distorted noise of tube amps isn’t going to find much to excite them here, but the MIYO does an excellent job of presenting a coherent picture of what’s going on. It’s not absolutely transparent. There’s still a slight amount of enhancement to the sound, which we found to be pleasurable rather than problematic. The soundstage was wide and engaging, managing to complement every pair of headphones we threw at it, and we found that we really enjoyed the clarity of each individual instrument in the songs we chose. Everything sounded precise, clear, and controlled. The highs had a good level of detail, and even over hours of listening, never wore out their welcome, or started to seem harsh. The low end was compact and tight, with basslines that showed off their power without being dominating. It’s a sound that has clearly been carefully tuned. The neutrality and transparency it offers would be valuable to anybody mixing music, while the clarity and detail is perfect for casual listeners. It didn’t blow us away – it’s not going to be replacing our Fiio A5 for pleasure listening, for example (full review here), or go toe to toe with something like a JDS Labs The Element, which doesn’t have the same precise metering, but which provides similar amp/DAC functionality. But there’s something to be said for transparency and neutrality, and the MIYO certainly makes a good case for it. You know what this reminded us of? Shortly before we got this, JDS Labs sent us a bundle of their amps to test, the reviews of which will be appearing shortly. The package included not only the aforementioned Element, but also their O2 amp. This is an amplifier based on a famed open source design that is aggressively, almost obnoxiously neutral – yes, we know that sounds strange, but it’ll all make sense in the review. The neutrality and objective quality of the MIYO’s sound reminded us of them O2, with perhaps a little bit more emphasis on opening up the soundstage. Sadly, we didn’t have them in the office at the same time, so we couldn’t compare them, but the sound signatures were definitely similar. Bottom line: while the sound may not be blow-your-head-off spectacular, it accomplishes exactly what it sets out to do by delivering clear, transparent sound that shows off music like it was meant to be heard. The MIYO might be small, but it’s also pretty pricey. While we think the $250 it currently costs is more than fair for the amount of technology and functionality that offers, we do wish its accessories were a little bit less barebones. Then again, if this helps keep the costs down, we’re all for it. We just have a thing for cool cases. The MIYO comes in a basic cardboard box, and the only supplied accessory is a very short (8”) micro-USB cable. You can always substitute this for a longer cable if you wish, any the existing cable is of a reasonable quality. But again, it would have been nice to see even a simple canvas carrier bag included here. Given the small size of the interface, it all but begs to be taken on the road. In the time we had it, we couldn’t help but think just what a pleasant surprise the MIYO was. It’s not going to change the game. It’s not going to knock bigger amps off their pedestals, or take on $2000 DACs. But there’s no denying that it is a very, very good piece of gear. It has intelligent and varied functionality that can be as deep as you need it to be, and which largely gets out the way when all you want is a simple method of connecting your headphones to your computer while improving your sound. It offers audio quality that gets the job done in a simple and efficient manner. It is light, tiny, and – despite the nuclear heat it throws off – a pleasure to use. We do have a worry, though. While we don’t think the $250 is unfair, by any means – especially given how much the box offers – we do think that it might turn off people looking for a few more bells and whistles. Despite the rainbow lights on the top, this is quite a subtle piece of equipment. It’s worth the asking price, especially if you need the advanced functionality, but there are definitely cheaper options out there. As an example, you could pick up something like a Native Instruments Komplete Audio 6 for $229. It definitely doesn’t have the same audio quality or functionality, but we’ve used it for years, and we can attest that it works just fine in almost all circumstances. That being said: we keep coming back to that impression of this being a pleasant surprise. It’s an excellent interface, it does its job incredibly well with very few real downsides, and we can’t wait to see what H2 does next. Clear, neutral sound with excellent spacing. Finding these was tricky, as we don’t really deal with dedicated interfaces on TMS. That being said, any of these will handle your amp/DAC needs, and all of them are viable alternatives to the MIYO. It’s not nearly as fully featured as the MIYO, and is definitely geared for more casual use (like smartphone listening) but we still enjoyed our time with this little amp. It’s very easy-to-use, and although the bass boost feels a bit tacked on, it sounds good. A very simple USB stick that plugs into your computer and offers immediate audio improvements. It doesn’t have the transparency or clarity of the MIYO, to be sure, but it’s just as easy to use, and cost a little less. It’s become one of the go-to amp/DAC combos for beginner audiophiles, and it isn’t hard to see why. You’ll probably miss the MIYO’s meters, which we absolutely adore, but there’s no reason you shouldn’t try this one out. This is more a dedicated audio interface for professional users, but after years of use, we can confirm that it’ll handle just about every audio need you have. It has a wealth of inputs, an excellent volume knob, and intuitive and well-laid-out meters. It’s not a looker, and it’s definitely getting a little bit long in the tooth now, but it’s still one of the best interfaces you can buy.